Each of the bellows are generally controlled by two solenoid valves, one to inflate and one to deflate. By energizing one of the two solenoid coils, the car can be raised or dropped. For compressed air, a brass valve with FKM diaphragm is recommended. Solenoid valves can be used in only one direction of flow (and pressure). There are different types: indirect and (semi-)direct operated. Indirect operated valves require a pressure difference across the inlet and outlet port of at approximately 0.5 bars for proper operation. 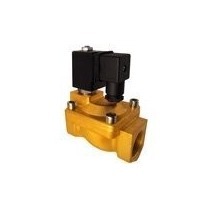 Direct operated valves operate without differential pressure.